Toys R Us has prematurely placed a few of the 2015 Technic sets on their website for sale. Though sometime this morning, they changed the status to Email when available, you can still head over there and take a close up look at these new sets which should not be on the shelves yet. It's nice advance view of what is to come. 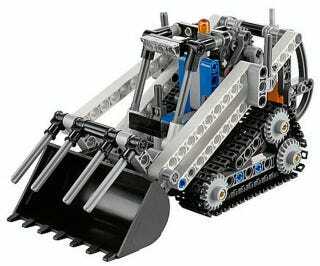 Compact Tracked Loader (42032) - Pictured above. This set comes in at 252 elements and has a pretty nice secondary model. Record Breaker (42033) - A pull back salt flat racer at 125 elements. Quad Bike (42034) - 148 elements, another cool pull back model!